The ratings below take into account the price of the cigar. Obviously a more expensive cigar would have better appearance, construction, flavor, etc. For the price this is an excellent cigar so long as the batch is a good one - occasionally I get a batch that is dry, flaky. What a surprise, I brought these in a sample package for the Romeo's. So, y'all have introduced me to the Curlys'. Thank you, for the quality of Cigars you carry. Great cigars, arrived in great condition, good packaging job. a great smoke...mild and natural, perfect for relaxing with a cocktail on the weekend! I highly recommend these! Should receive cigars today, the cigars are always very fresh, the cigar itself smokes & tastes real good, good burn. Can't beat for the price. Add I the free ship on top of that a great deal. Perfect 9 hole's of golf cigar. I have yet to have a bad fuente cigar. these are good size for me, they have a good flavor and burn very well. for the price they are hard to beat. great cigar for a go to cigar. always count on Fuente . I smoke expensive fuentes and don pepin but when I want to save money this curley head and the green box baez of don pepin are a great value . nick adams was happy. nick looked at the two hearted river. he then lit the Fuente . nick liked the day Michigan clouds were above. nick smoked the cigar. nick adams was happy. Were at the correct humidity. A very good value. Wish there was a larger ring size at this quality and value. I am very satisfied and have friends very much interested. Middle of the road cigars, but extremely smooth and pleasant to smoke. This cigar is pretty good for the price. Flavor is good but unravels too easily. What a great cigar. This is cigar that I can enjoy anytime anywhere. Cigar is a great quick smoke. Construction is excellent for such a lower priced cigar. Price is excellent for this product. I bought these for the cheap price as a daily smoke around the farm, it fulfilled it's purpose. Arturo Fuente Curly Head Deluxe Natural is rated 4.3 out of 5 based on 34 customer ratings. 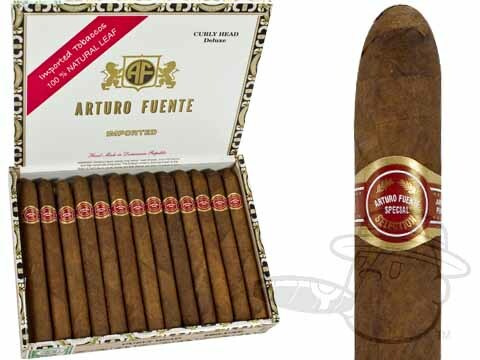 Didn't these Arturo Fuente Curly Head Deluxe (Box of 25) come individually wrapped in cellophane for extra freshness ? It doesn't look like it the way you have them pictured...I know the boxes at my local Total Wine store humidor room do come wrapped. Yes, they are all individually wrapped in cello.